Here are the steps to setup your Mac to work with your Git repo with the same key that you’ve been using on your other development machines. Now that your .ssh folder is open in the finder you can easily drag/drop/copy your pre-existing id_rsa file into it. Finally, check again for the list of identities – there should be one more than before (or just one if there weren’t any previously). If you haven’t already discovered Brackets then IMO you owe it to yourself to download it and check it out. 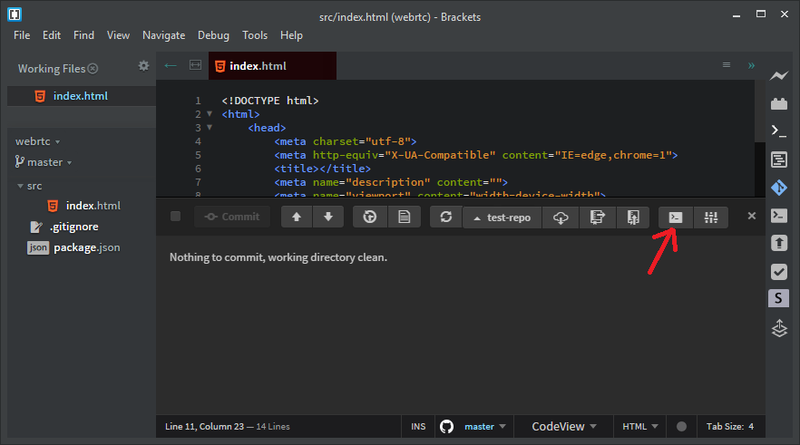 Its an Adobe-backed open source text editor geared towards web development with many exciting features. 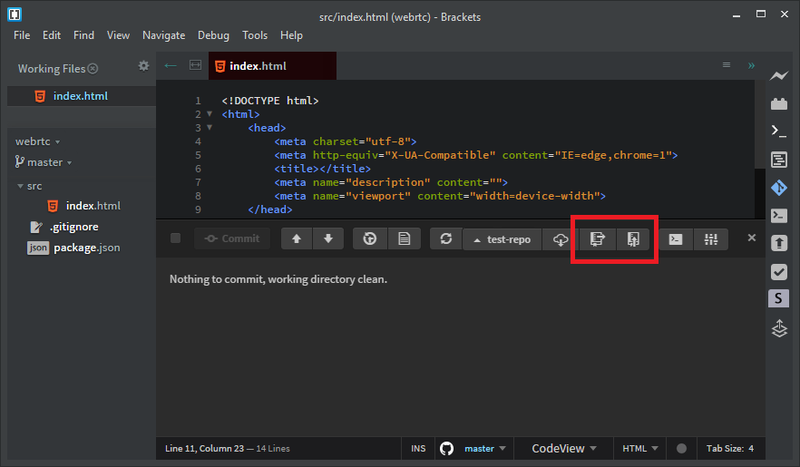 2016 will see Brackets being brought into Adobe Dreamweaver as the default code editor (incidentally, Intel’s XDK already uses brackets) along with Edge Reflow’s responsive design features. 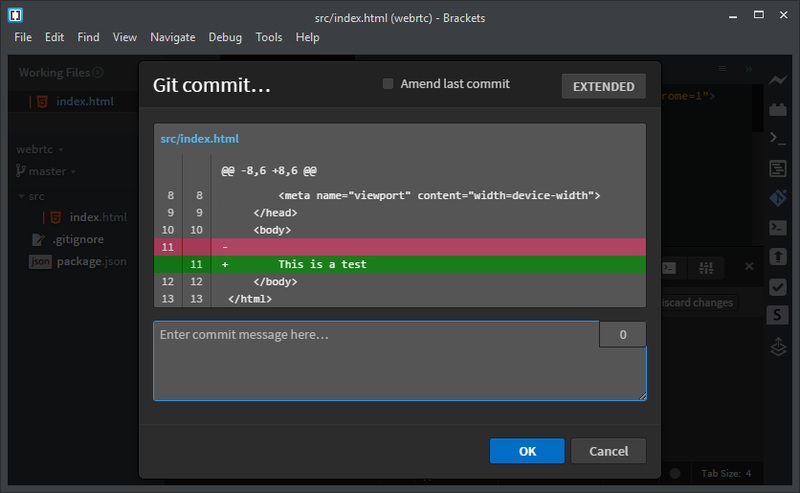 Anyway, one of the cool things about Brackets is that various devs have created plugins to integrate Git into Brackets, such as UnGit or Git Branch. The most feature rich of them is a plugin called Brackets Git. In fact, according to the publicly viewable Trello card-wall it is likely to be integrated into Brackets as part of the application. So then, lets take a look at Brackets Git. I’ve just started working on a project – I ran npm init and git init to help get things started. How many times have you started working on a project without realizing that you were in the wrong branch? Brackets Git provides a branch drop-down in the file pane showing you your current branch and also facilitates branch switching and creation. Notice the current branch – I’m currently in the Master branch and I can verify by using the git branch command in Git Bash. As the current branch is always visible It’s easy for me to see the current branch without leaving Brackets. Once you enter your new branch name and click “OK” the branch is created and it becomes the current branch (akin to doing git checkout -b branch-name). As before you can check via Git Bash to see if this is what truly happened. Hereafter, you can select your working branches via the branch drop-down in the file pane. On a side note, I created a test branch via this method and verified it in Git Bash. Next I deleted the branch using Git Bash and then switched to Brackets to see how the plugin would handle this. It handled it fine with no issues and correctly displayed the changes made via bash. One thing I observed was that once in a while if I create and change to a new branch via the console $git checkout -b branch-name-here that the branch drop-down didn’t update to indicate both the existence of the new branch and that the new branch had been checked out. To resolve this I selected a different branch within Brackets which caused the branch drop-down to refresh and thus reveal that branch in the list. NOTE: When creating a new branch you should realize that the new branch will always be based on your current branch!!!! If you want to create a new branch off of master then always select the master branch ***before*** creating your new branch! Ok, we’ve seen how we can use the branch drop-down to quickly create and move between branches, how about tracking, adding and committing files? Here’s a screen shot of the same project but this time with the Brackets Git UI opened – you access it by clicking the Brackets Git icon in the plugin toolbar. The Brackets Git interface needs some explanation – the first thing you might notice is that my project has untracked files. Being that this is a brand new project and nothing has been committed I need to do my initial commit. 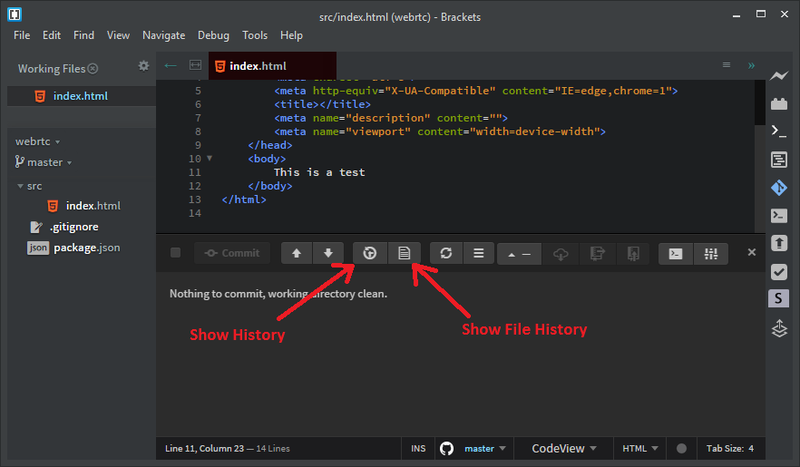 I don’t need to use the console for this as Brackets Git can help complete that task without leaving the editor. Git Bash shows me something a little different, that I have an untracked package.json and an untracked src/ folder. Within that folder lies the untracked index.html – its a small discrepancy but one that Brackets Git feels isn’t worthy of telling you. Lets use Brackets Git to do the equivalent of issuing a git add command. As indicated above you can see that the two files are now being tracked. Lets see what Git bash shows us now that we’ve done this within Brackets. As you can see both the package.json and the src/ directory are now being tracked. 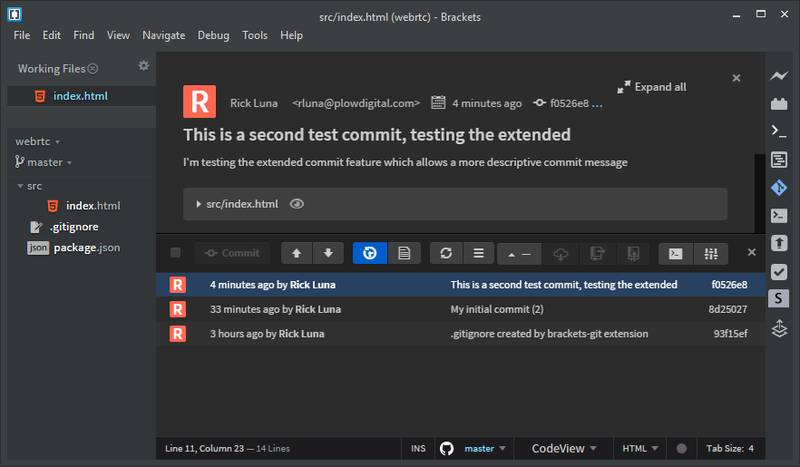 Whats cool here is that Brackets Git shows you what was edited when you do a commit, akin to doing a git add -p. The “EXTENDED” button lets you type a longer message. 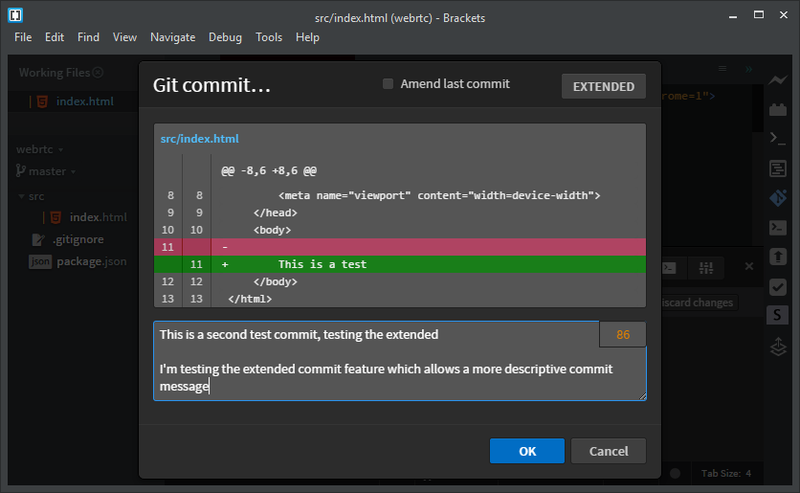 I imagine that if you don’t click the “EXTENDED” button that you are in reality doing a git commit -m “message here” and if you do click “EXTENDED” you are doing a git commit which at the console or Git Bash triggers VI or some other text editor to appear. For now I won’t try the “EXTENDED” option but will do so shortly. 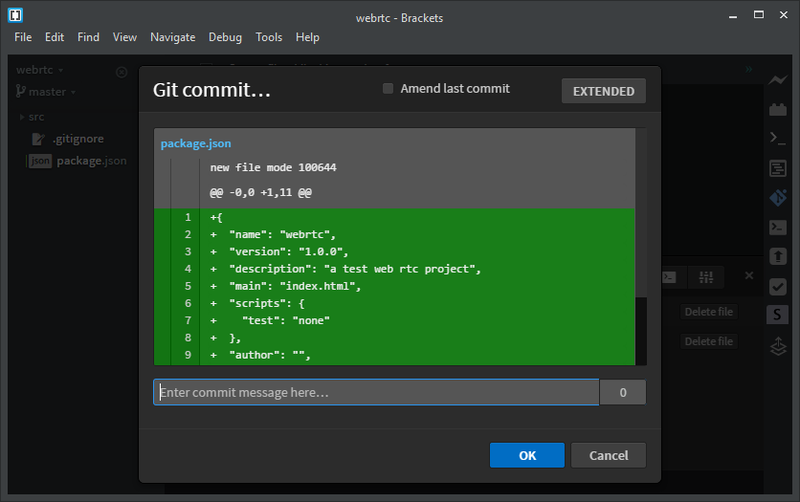 You may have noticed the option to “Ammend the last commit” in the “Git commit…” dialog. Lets give that a try – I’ve edited the index.html so that its no longer an empty file. Via Brackets Git I’ve added it and have clicked on the “Commit” button. 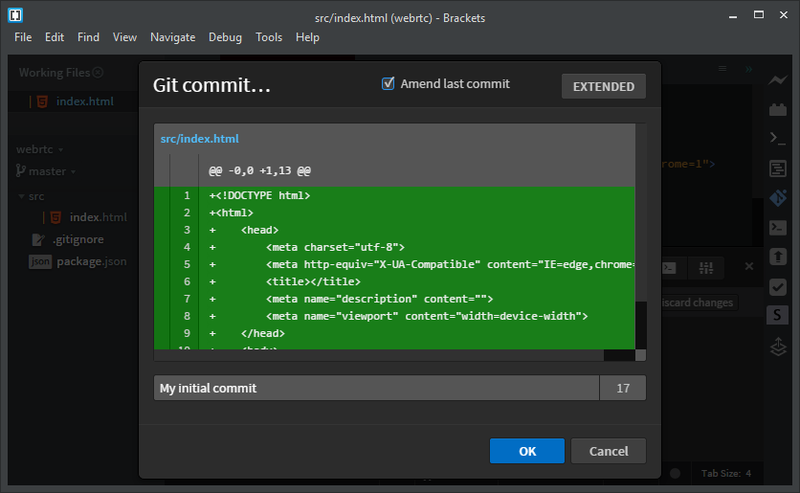 In the screen shot below you can see that I’ve also checked the “Amend last commit” checkbox – and that by doing this the message text field is populated with the previous commit’s message. To make it obvious that I’m amending the commit I’ll change the commit message to “My initial commit (2)” – and will click the “OK” button. As before Brackets Git updates and tells me that the working directory is clean. Lets take a look at Git Bash to see what happened. As expected, the previous commit was amended with the new commit message. Lets try adding an “extended” message. If you don’t already know, the first 50 characters of a commit’s message is used by Git as the commit’s subject line. That’s why you see the character counter next to the message field. By clicking the “EXTENDED” option you’ll see the single-line text field change into a multi-line text area. The first line must still be less than 50 characters but now you have more room to enter relevant text to describe your commit. The section following this one will explain why this matters. Now whats cool about the above screen capture is that you are seeing what was changed in the committed file – it pays to review the edits you are about to commit before you commit them. If there were more than one file you would just scroll through them all via this dialog. Unfortunately, you can’t cherry pick edits…. some things you just have to do in Git bash…. As you can see the first line (our commit subject line) is less than 50 characters – but the counter keeps going as I type. As soon as I exceed 50 characters in total it turned red. I suppose the plugin author may want edit the plugin to only count the first line of text – maybe stop counting at the first line break / carriage return. Anyway, leaving a blank line in between the first (subject) line and the body of the message is how you distinguish between the two. Ok, time to commit by clicking the “OK” button. 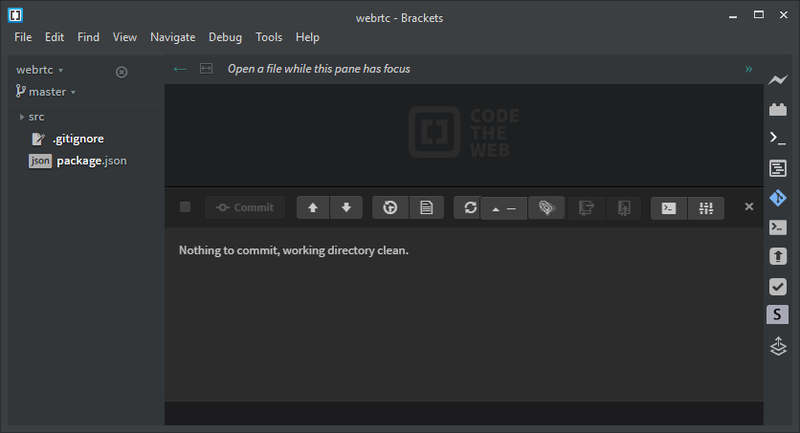 Like the previous commits, the Brackets Git interface updates to let me know that there is nothing to commit and that the directory is clean. Lets look at what happened via Git Bash. The above screen capture verifies the commit and you can see the second commit and its longer message. Above, circled in red, is our 50 character or less subject line for the commit where we added a separate description using the “EXTENDED” commit option. You can see how neatly it fits in the window. Imagine trying to read something much longer – it wouldn’t fit and would be truncated at the 50 character limit. That’s why commit messages should be short and concise and the extended option should be used if a longer / more detailed description is warranted. In the above example you can see that I’ve clicked on the most recent commit and that I can see the extended text of that commit. You can also inspect the individual file changes by toggling the arrow next to each file name or by clicking on the “Expand all” button in the upper right corner. Alright, its time to see if we can push using Brackets Git. Everything I’ve done up to this point has happened locally. 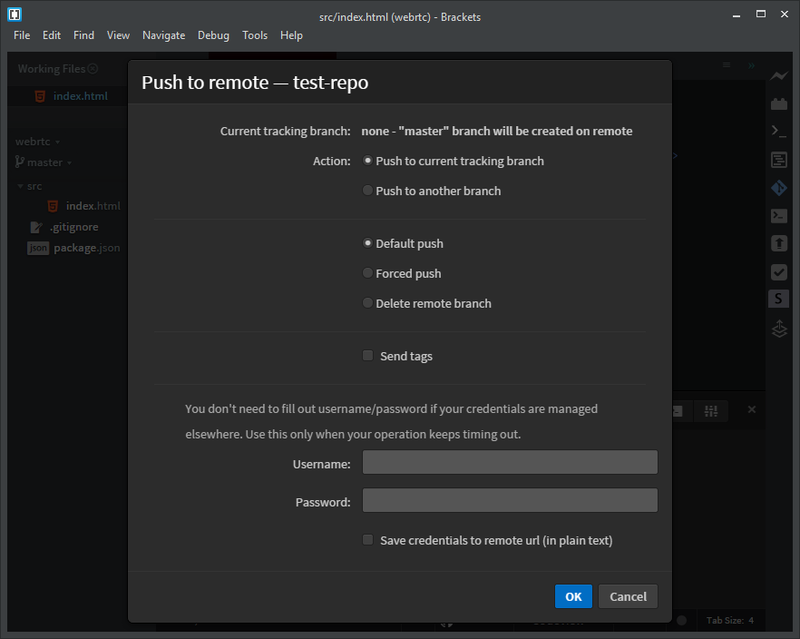 I’ve just logged into my Github.com account and created a test repo called… (drum roll)… “test-repo’. I need to now let Brackets Git know about it. Lets start by clicking the “Pick preferred remote” button where the option to “Create new remote…” will appear. Selecting the “Create new remote…” option will result in a wizard walking you through the steps of adding a new remote. Click “OK” again and you will notice that the Push/Pull buttons have become enabled. 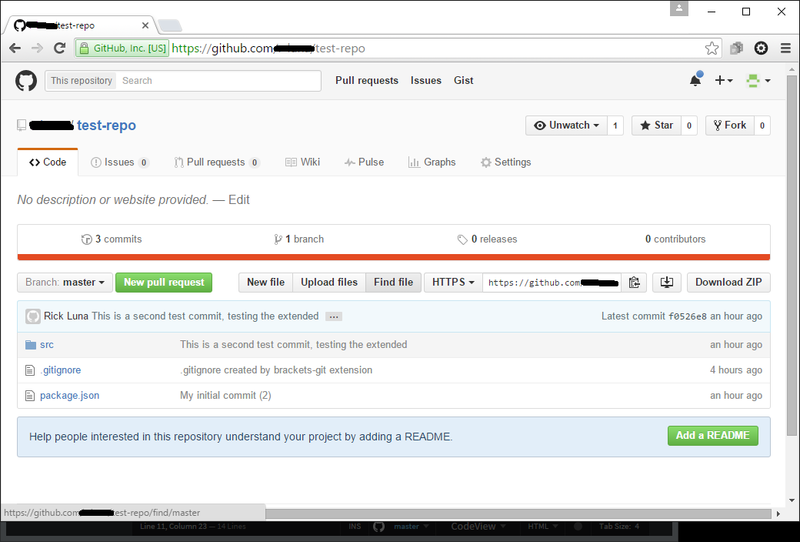 To verify the above I visit the repo itself at GitHub. I see exactly what I expect to see – the single Master branch, my 3 commits and the associated commit messages. Lastly there are some things that can only be done via a console. Brackets Git provides an easy way to launch the console via the “Bash/Terminal Console” button. If you’re like every other developer (including myself) your go-to for help is Google – just type a question and a whole sea of answers are there to choose from. Git is pretty deep in terms of its functionality and many features are rarely used thus Google is often our friend in that regard. 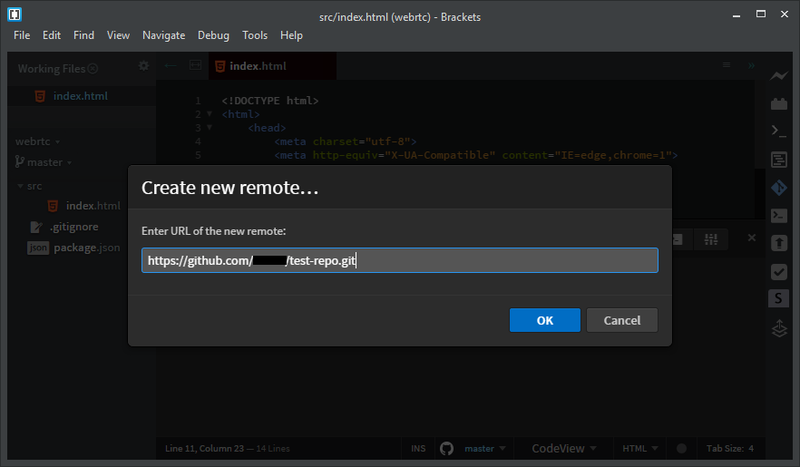 Depending on your familiarity with Git using the help features that are built into it might speed up your workflow when you wonder what the proper way to use a Git command is. I use Git Bash – the command line interface for Git and I wondered the other day if there were any man pages for it. A search online reveals that there are some installable packages or other alternatives to get “man” functionality… but before I started that search I stumbled upon a man page without installiing man…. Notice that I used a switch that Git didnt understand and the result was a man page for the Git command. I did search for how to not “trick” Git into giving me a man page but only found pointers towards installing man files. The above works for me for now even if Git considers it to be a mistake. To Launch any of these guides simple issue a git help followed by the name of the guide and the guide will launch in your browser. 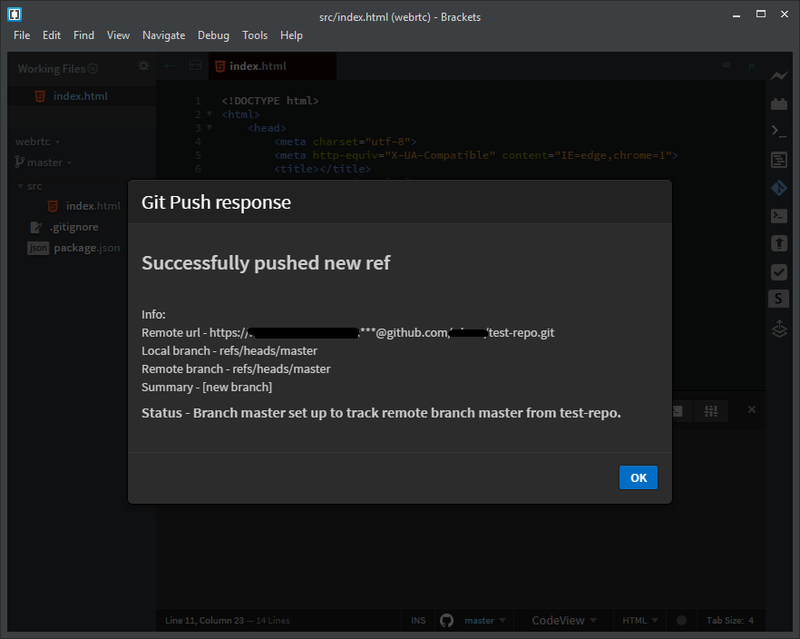 Quite often when using version control (Git, GitLab) you will need to create a new branch where you can develop in isolation from other developers / the master branch. Below are the basic branch-related commands to help you get started. You should create a branch that encapsulates a single train of thought that depends on your workflow. If, for example, you are creating a product which has a list of features you can create a new branch per feature. This would allow your various team members to work on the same project on different features without overwriting each others work should the various features happen to utilize some common files. Given the above, you may still have some code collisions when you merge in which case GIT will alert you to that fact so that you can manage resolve the conflicts as needed. Another scenario would be if you want to experiment with something without directly impacting the master branch. You could then create a new local branch and feel safe knowing that if what you’re doing doesn’t work you can easily return to the master branch to create yet another branch based on the master sot that you can pursue the issue in a different way. For information on a workflow that utilizes branching view this article: A successful Git Branching Model. The naming conventions allow us to more easily manage our branches. To view all the branches in the repo that you have worked on issue the following command. The resulting list will place an asterisk in front of the currently checked out branch. By default you will only see those branches that you have created. Other members of the team may have pushed branches that you don’t yet see in your copy of the repo. The "remotes" are the branches that are part of the remote repo that you do not yet have a local tracking branch for. A message will appear letting you know that you were successful. …to ensure that you have the latest version of the files especially if other members of your team are committing to the same branch. While working in your new branch you can commit as often as you like. You may even push your branch back up to Git should you need a copy there as well – which would allow other team members to download your latest committed/pushed work so that they can contribute. Its ok though to work locally without pushing your branch to the repository. 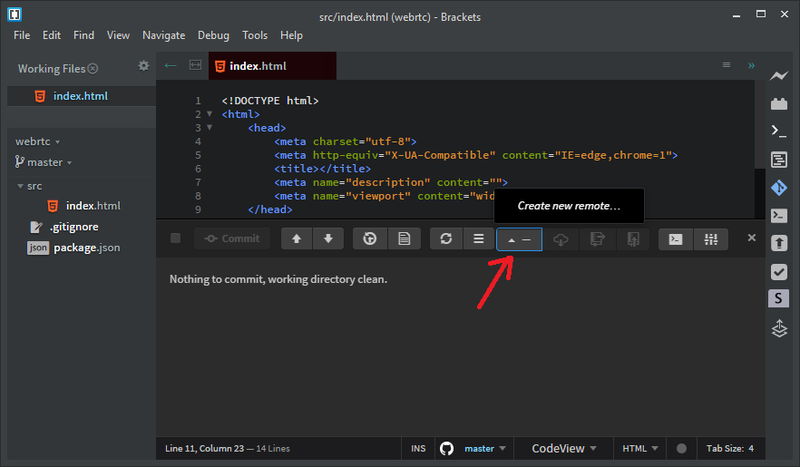 When you are done with your edits, have tested everything and feel that the changes are ready to be merged back into the master branch you can do the merge yourself or you will have to create a merge request. For the latter you will definitely need to push your branch to the repo. 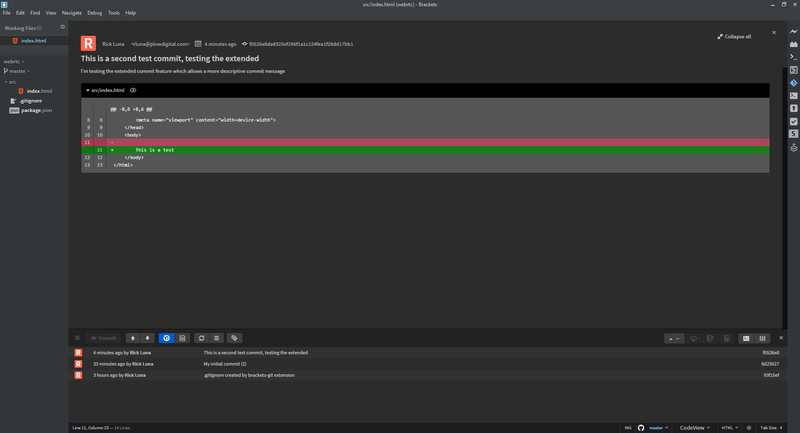 As you can see above the first thing to do before merging your branch is to “pull” the latest copy of the master branch. What if the Master Branch is Updated and I Need Those Updates in My Working Branch? This will “rewind” the edits you made to your branch back to the point where the branch is at parity with master, then the master updates are applied and then Git “plays” your changes back on top of the updated master. If you want to be able to interact with your Git account without using passwords then you need to create an SSH key pair. You will then share the public key with GitHub to indicate to your repo that your computer is trusted. The first thing to do is to create the keys. There are a couple of ways to do this on Windows, the easiest IMO is to use Git Bash. You will be prompted for the file name and location but the default will be shown to you, illustrated via the following example. Hit “Enter” to accept the default. Next you will be asked for a password. You probably don’t want a password so that you can push to your Git repo without being asked to provide one. In that case, just hit “enter” and move on. Your identification has been saved in /c/Users/Rick/.ssh/id_rsa. Your public key has been saved in /c/Users/Rick/.ssh/id_rsa.pub. Your key will appear within the Git Bash console – copy the key text starting with “ssh-rsa” and ending with your entire email address. In Windows you won’t be able to simply highlight the text itself at first. Hit the “CTRL + a” key combination to select everything. This enables the ability to do a normal “click drag” text selection. Select your Public Key and hit “CTRL + c” to copy it. From here…. you likely want to use it with your GitHub account. Log into GitLab and navigate to the project.